Today is 2 September, we are just past the fifth month anniversary of Liberia’s first encounter with the Ebola virus. We are now 41 days into a declared national health emergency, 28 days into a national state of emergency and on the 16th day of an imposed national curfew, the first since our civil conflict ended in 2003. Nine international airlines have cancelled or suspended service to Liberia, with only two international carriers continuing to operate, overbooked and overpriced. As of two weeks ago, 613 lives have been lost to the Ebola virus, a total of confirmed, probable or suspected cases. Countless others have also died because the frail remnants of the decimated hospitals, clinics and health centers simply cannot cope or health care workers are too afraid to treat more common illnesses or conduct routine procedures. The Ebola virus has hit us at a vulnerable time: we are already on our third successive year of budget short-falls, low global prices in our export commodities and subsequently, high inflation and a soaring exchange rate. Obviously, this has been more than a clarion call for us as the Rotary Club of Monrovia and our Ebola support campaign began at our leadership induction on 4 July. During her speech, Rotarian Vicki Cooper-Enchia, our club president, committed the club to raise US$1,000 to purchase gloves for health care workers responding to Ebola patients. We reached the target that same day and donated 10,000 gloves to the Ministry of Health on 7 July. Since then, the number of recorded cases has nearly tripled and we’ve also stepped up our resource mobilization and response. Through our club members who work in the Ministry of Health and Liberia’s largest teaching hospital, the John F. Kennedy Medical Center, we established contact with national response leaders to get accurate information on priority needs. Over the past six weeks, our club has raised US$21,000 from organizations, companies and individuals to support our Ebola response campaign. This tremendous generosity has allowed us to provide urgently needed items to hospitals, Ebola holding facilities and the Ministry of Health. As we continue to donate, the needs also continue increasing in efforts to contain this deadly virus. Our donations to the government have included 10,000 examination gloves, 3,000 pairs of sterile surgical gloves, 1200 pairs of gynecological gloves, 100 plastic buckets with spouts for hand-washing, 80 PVC covered mattresses for patients in holding & treatment facilities, 120 pairs of rubber rain boots for health care workers, fuel coupons for Ebola response vehicles, soap, bed sheets and mattress covers, tarpaulin for reconditioning a temporary hospital waiting area and assorted medicines and food items for patients undergoing treatment. We hope to continue to support the national fight against this disease with a US$100,000 fundraising target to make our impact felt. Our demonstration of Service Above Self, through this Ebola response campaign has gained the respect of the Ministry of Health, the businesses we have engaged for supplies and the attention of the press. We are committed to doing more and are hoping to harness the goodwill of Rotarians around the world. Donate to our Ebola campaign here! The Ebola Virus Disease (EVD) causes hemorrhagic fever and currently has no cure. Infected patients receive supportive care and fatality rates are between 60-90%. The virus is spread through direct contact with bodily fluids of an infected person once they are demonstrating symptoms – high fever, sweating, diarrhea, vomiting, bleeding and internal organ failure. My heart goes out to ALL my fellow Rotarians who as usual find a way to deliver. We can never forget our creed…*Service Above Self*. 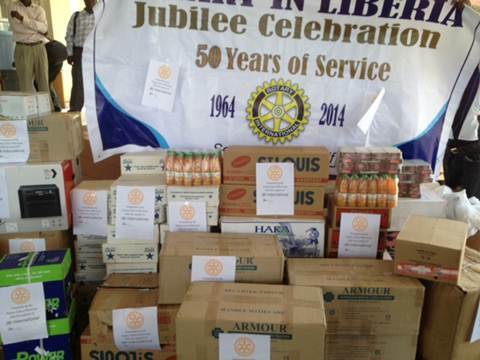 Being a proud Rotarian, I cannot applaud my colleagues enough. I can only say thank you for making Rotary proud. Please keep us up to date. How can we send you money? It’s always a great relief to know that our fellow Rotarians the world – over can put self aside to cater for the sick and less fortunate. From the deepest part of my heart…I say thank you my fellow esteem Rotarians. Many thanks for your concern and willingness to support. We are working through Rotary networks to continue to engage clubs around the world and forge partnerships in battling Ebola. 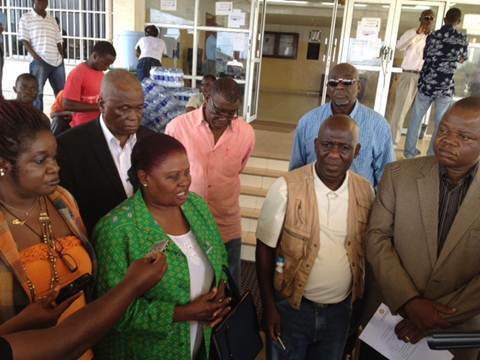 Given the increasing limitations on shipments and commercial flight options, we are continuing to focus our efforts on using contributions to purchase items locally in Liberia and donating them directly to Ebola treatment centres, holding facilities and laboratory testing facilities, in collaboration with the Ministry of Health. We have also recently raised GBP 8500 through the leadership of the Rotary Club of Marlow, UK. Please send me an email at missmcooper at gmail dot com and I will pass along our banking details, including corresponding bank information etc.